Should health systems send patients abroad to save money? If you were offered the possibility of being treated or operated in another country more rapidly and at a lower cost to the government, what would you say? Your answer will probably depend on the country and hospital in question, your family situation, and the quality of care offered. According Régis and her colleagues, the concept of “medical tourism” should be thoroughly analyzed to assess which avenues may – or may not – be beneficial and in which legal, ethical, political, and economic frameworks. Seeking treatment abroad is in fact not a new concept, far from it: in ancient times, the Greeks and Romans roamed the Mediterranean in search of places to purify the body and mind. “Few data exist today to accurately estimate the magnitude of the phenomenon, but those available and the growing number of medical travel brokers show a real trend, though it is less marked in Canada than in the United States,” Régis said. In addition to individual reasons, governments and insurers may be amenable to some health care services being provided abroad. “In 1999, to allow greater access to care in the area of radiation oncology, the Quebec government signed an agreement with various hospitals in the eastern United States, and in a little over a year, 1,052 patients were received,” Régis explained. 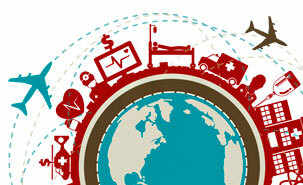 Nevertheless, public perception challenges the idea of delegating care to foreign hospitals. “If given the choice to be treated in the United States or India, it is very likely that Canadian patients will opt for the United States because they perceive treatment in India as being riskier. But this is not in fact necessarily the case,” Régis explained. Indeed, to counter this perception, countries promoting medical tourism join international accreditation agencies and hire health professionals trained at the best American universities. Actual quality of care is indeed an essential prerequisite in order to obtain the public’s trust, and this quality of care would have to be based on credible and independent assessment. Other components would also have to be examined, including the issue of post-treatment follow-up, patient compensation in medical malpractice cases, and the effect of transferring services on the health systems of countries practicing medical tourism, particularly in terms of human resources and social equity. Régis believes that any law and regulatory changes relating to medical tourism would have to be evidence based. To achieve this, she and her colleagues recommend the creation of an interdisciplinary working group to study the legal, economic, ethical, psychological and medical implications for the government and individuals of delegating certain health services to foreign hospitals, including hospitals overseas. In any event, Régis and her colleagues insist that patients themselves should decide whether or not be treated outside their own community. “While being open to transferring medical care to other countries to better evaluate options, we must still always respect the right of patients to decide where they want to be treated, despite the incentives that may be put in place,” Régis said.